The Kosova delegation visiting Iowa can bring home lessons of community development and ideas on improving farming and public health sectors. Iowa National Guard troops have helped to keep peace in Kosovo over the past eight years. Now Iowa soldiers and civilians are launching an effort to strengthen and stabilize the southeastern European country. A 13-member delegation of government officials from Kosovo spent four days here last week [August 9 – 12] as part of a new state partnership program with Iowa. They met with Gov. Terry Branstad, toured military facilities at Camp Dodge, talked with Iowa State University officials in Ames, consulted with state health and agricultural leaders, and visited the Iowa State Fair. "I am really impressed with the hospitality of the people here, how well we have been accepted and greeted," said Agim Ceku, Kosovo's minister of security forces. He said his country's partnership with Iowa will help to professionalize its military and will build cooperation to improve Kosovo's farm sector, public health programs and schools. The formal ties between Iowa and Kosovo were announced by Branstad in March. A delegation of Iowa officials, including Maj. Gen. Tim Orr, adjutant general of the Iowa National Guard, traveled to Kosovo in May. "We are looking at this from a holistic approach. This isn't just about the military aspect" of how the Iowa National Guard can help the people of Kosovo, Orr said in an interview. Kosovo, formerly a province of Yugoslavia, is within a region that has long seen bloody ethnic strife. Kosovo declared its independence from Serbia on Feb. 17, 2008, and the following day the United States recognized Kosovo as a sovereign and independent state. 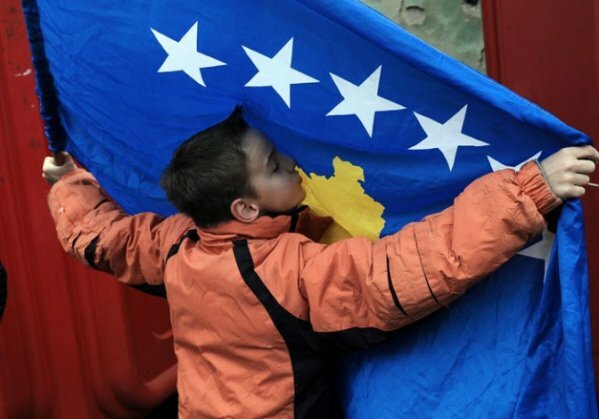 As of November 2010, 72 countries had recognized Kosovo's independence, including 22 of 27 European Union member states, along with all of its neighbors except Serbia. In April, Vladimir Petrovic, the Serbian ambassador to the United States, said his country recognized that Iowa's commitment to Kosovo was being made with the best of intentions. But he said Iowa's role raised concerns because his country contends Kosovo's leadership committed war crimes. Kosovo officials said the allegations were unproven. A U.S. Defense Department official said the United States supports the investigation of such charges, but believes the engagement with all U.S. partners in the Balkans, including Serbia and Kosovo, will help strengthen stability, cooperation and the rule of law in the region. Ceku, 50, a former prime minister of Kosovo, is a former senior military commander. He agreed to an interview last week with The Des Moines Register under ground rules set by the Iowa National Guard that limited questions to the topics of his delegation's visit to Iowa and his country's partnership with the Iowa National Guard, while excluding any questions about his country's alleged war crimes. Former U.S. Ambassador Victor Jackovich, a Des Moines native who served in the Balkans in the 1990s, is a longtime acquaintance of Ceku. In an email, Jackovich, who is now based in Vienna, described Ceku as a "tremendously pivotal figure in the Balkans." He said Ceku's visit to Iowa last week was a historic step for Kosovo, adding that he had been honored to host Ceku in Washington, D.C., during the leader's first visit to the United States in 2004. Since 2003, more than 700 men and women of the Iowa National Guard have served in peacekeeping roles in Kosovo. In April, 65 soldiers from Company C, 2nd Battalion, of the 147th Aviation in Boone returned to Iowa from a yearlong Kosovo peacekeeping mission. Col. Gregory Hapgood Jr., the Iowa National Guard's public affairs officer, said it has been the tradition of Iowa soldiers serving in Kosovo to also engage in nation-building activities on their personal time, such as teaching students English and helping with other types of community betterment projects. The Iowa National Guard plans to send a full-time Iowa military officer to Kosovo in September to begin a two-year tour to help coordinate projects between Iowa and Kosovo. Ceku said that in visiting here he was surprised with the significant public respect granted to Iowa National Guard soldiers and the high spirit and morale within the Guard. During his Iowa State Fair visit with Orr, people kept approaching Iowa soldiers and thanking them for their service. Some of the Iowa fairgoers even expressed thanks to some Kosovo soldiers who wore their uniforms in Des Moines, mistakenly thinking they were Iowa Guardsmen. "For a soldier, that is the most important thing, that people appreciate their service," Ceku said. "Whoever saw them, they said, 'May I shake your hand?' I saw how much confidence there is and how proud they are of that." Ceku said his hope is that someday the differences between Iowa National Guard soldiers and Kosovo security force troops will be indistinguishable. "This is just the beginning. Now we have a model and a partner to build our security forces to the highest standard," he said.